Welcome to our post on the Best Solar-Powered Pond Pumps & Solar Fountain Pumps of 2019. We realise that everyone has different requirements of a pond pump, some may want to simply use one for aesthetic purposes, as a water fountain, whereas others may want to use one for aeration benefits. We also understand that there are other important variables, as each reader will have a different size pond, located in a different outside environment, but most importantly… each reader will have a different budget. Therefore, we’ve identified each pump based on the size pond that it’s suitable for, alongside the main functional uses that we would recommend that you use it for; Alongside this, we’ve ordered the list based on the budget requirement of purchasing that particular pond pump… Making the process of choosing the ideal solar pond pump easier for you! Oh, not to forget. We’ve also featured an Editor’s recommendation for you readers with minimal time, and a section on technical specifications for each pond pump for you readers who want to learn more about the specifics of each pump. Top Solar Pond Pumps and Solar Fountain Pumps of 2019? What is a solar pond pump? How can I find the best solar pond pump for my pond? 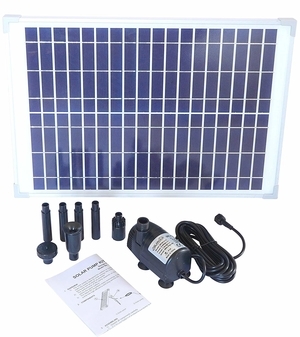 SOLARIVER Solar Pond Pump 400+GPH - Multiple GPH Models Available Up to Large Ponds From $70 Buy on Amazon For value and high quality, this is our featured Editor's Recommendation. Important Update* SolarRiver have added a larger range of solar-powered pond water pumps to their Amazon listing, all of which we have linked to below. The main difference between these pumps are the wattage requirements, and some even include batteries. Based on reviews of the 20-watt pond pump itself (Featured directly below), it’s clear that this pump is extremely versatile, with one reviewer (who also left a 5* review) stating that he/she used this pump continuously for 373 days in a 300-gallon koi pond, impressive! Another reviewer talks about using the pump in their 12000-gallon swimming pool. Now although we probably wouldn’t recommend using this in a swimming pool, since you should really get a more powerful aeration pump for this, we do recommend the SolarRiver pump range is suitable for Small, Medium and Large sized ponds. 1 Year Warranty – 100% Money Back Guarantee if the pump kit doesn’t meet your water pumping needs! This pump is the perfect all-rounder. It’s truly built to last, with the brushless magnetic motor offering over 20,000 hours worth of low-noise operation. The advancements in technology in these magnetic driven pumps means that this new generation of pump can handle all-day operation, as opposed to the traditional Bilge pumps which were not designed for this. 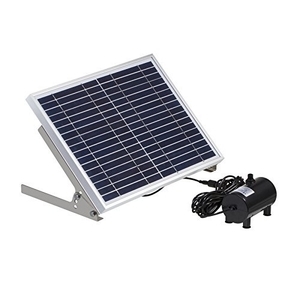 The pump has a 20W polycrystalline solar panel, this is rather powerful and should be suitable for small/medium sized ponds, whether or not you are using the pump for water circulation or more for an aesthetic purpose. The panel has a durable aluminium outer frame and includes a stake for placement. The panel connects to the pump via a 16-foot lead, yes that’s right, a 16-foot wire! This means that you are given the freedom to place this in any position within your garden that gets the most sunlight, allowing for continuous operation. No wiring needed, all you need to do is plug in, set this panel in the sun and say goodbye to all of those expensive electricity bills! Sounds good! In conclusion, whether you’re looking to buy a solar fountain for a large pond, or a small solar pond pump, you really cannot go wrong with any pump from the SolarRiver range, whatever the purpose. Like we’ve shown, we’ve heard about people using this in their 12000-gallon swimming pools, whilst they holiday for three weeks, returning to a perfectly conditioned pool, all thanks to this Solariver pump operating perfectly; And there’s no risk as you get a 1-year manufacturers warranty. Pump and Panel Kit – Includes two solar panels, four 3-inch extension tubes, two ground spikes, two-panel brackets, 2 spray heads and 16-inch cable. 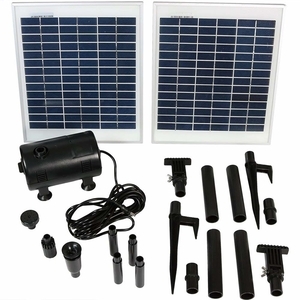 This submersible pump and 2 solar panel kit is ideal for outdoor use, in any size pond. The pump can push out a maximum of 396 gallons of water per hour, and can spray up to 120 inches high, and with the 2 different spray heads, SunnyDaze Decor has included a few options for that wonderful water feature effect. 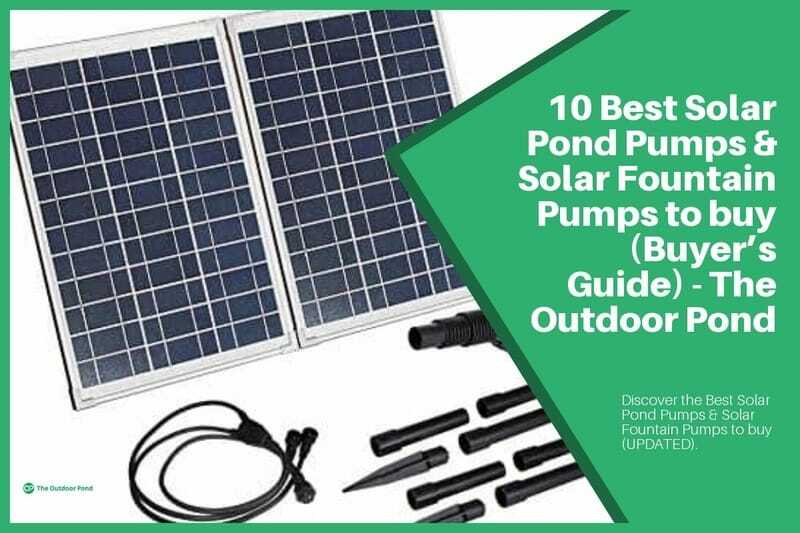 With this being said, this pump is a great allrounder, being able to sit deep within the pond and, thanks to the 16-inch cable length connecting the pump to the powering solar panels. Both solar panels are connected together by one 24-inch cable, and these panels must be in direct sunlight to operate at their optimal capacity. These panels do not store solar power. Solar Panel runs on 18V-15W: Glass Panel and Aluminium Frame. The Tangpan brushless solar-powered pond pump system is an extremely versatile system, with the capability to run in a small/medium or large sized pond, thanks to the high maximum flow capacity. This pump can really pump water high, with a maximum water height of 2.5 meters, and would be suitable for pond owners who value this as an important requirement. Make note, the company Tangspan do not state whether or not a warranty is included with this particular pond pump system. 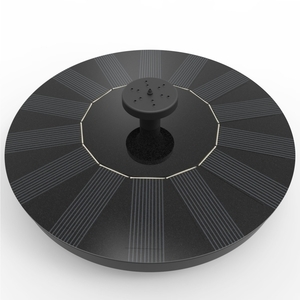 Update* As of February 2019* – The Lewisia Solar Pond Fountain pump is now back in stock. 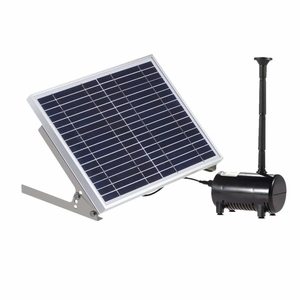 The Lewisia brushless pump is a 10w pond solar fountain pump that is capable of a water flow capacity of up to 357 GPH. When taking into consideration the price of this pump, this demonstrates extraordinary value for money. The pump comes with a wide range of fountain spray nozzles, so not only does it provide a good amount of aeration within the pond, but it also provides the capability to achieve multiple water patterns. 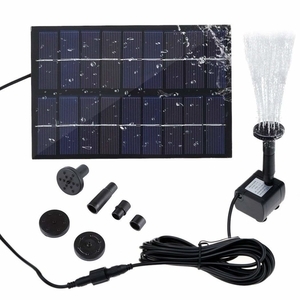 Overall, this is a very good, extremely affordable, solar powered water fountain kit, and hence if you’re on a budget, this is certainly a solution. 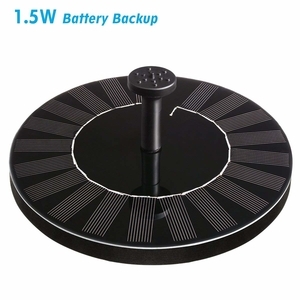 However, in direct comparison to our equivalent editor’s recommendation [SolarRiver Solar Pump – 10 Watt with Solar Panel ($99.99) – Buy on Amazon], although the Lewisia pump is $30 cheaper, it does not include the same 1-year manufacturer’s warranty and does not have as good customer reviews. 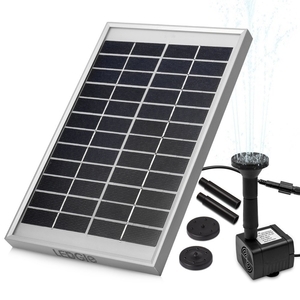 This eco-friendly solar powered pond pump is extremely similar in specification to the Luxjet 5W pond pump [Link to Amazon] with similar review status, but better customer support, which is especially important with any product that you decide to purchase online. It too is easy to install, operate and maintain, and it can be placed in any position, with no screws or plugs being required. The pump itself has a water flow of 100GPH, and projects water to a height of 47 inches (120cm). It comes with multiple fountain nozzles, so you can swap and change whenever you feel, creating a new aesthetic water feature spectacle for your garden pond. The SIEGES mini submersible pond pump is the perfect option for a small pond. It can create good strong flow in a small pond to provide oxygenation for the plants. It’s compact design is great for space-saving. The maximal flow rate can be up to 60 gallons of water per hour. Lift height can be up to 2.3ft. Again, this pump should only be used for very small ponds, or small fountains. It cannot handle the same amount of water displacement as other recommended pumps, such as the SolarRiver pump. This pump is perfect for operation in shallow waters, i.e a very small pond or birdbath. As we’ve found out from people who own this pump, it only works in direct sunlight, any cloud will diminish the UV signals received by the photocell, which means that the pump will not work to its optimal level. Considering the inexpensive price of this pump, it’s a great little addition to your birdbath or shallow pond. 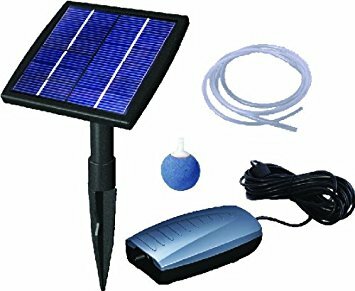 For those of you looking for a very small solar pond/fountain pump with a battery, this is the one for you! The battery is charged by the photocell, which simultaneously powers the pump. Once sunlight has gone, the pump will begin to use the stored battery power it has accumulated throughout the day… meaning even when the sun goes down, your pond pump will still be functioning! I must reiterate, this is a very small pump, and if you have a medium/large pond and are thinking about getting this over one of the more powerful pumps, I suggest that you don’t! The large pumps shown above will better aerate a larger pond, even despite not being on during the night. However, if you have a medium/large pond and are only looking for a small visual fountain, this is a nice option! 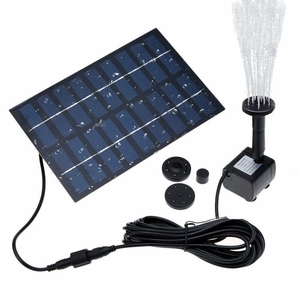 This solar powered pond & fountain pump comes with an external solar panel and stand. The pump is able to keep small/medium ponds well oxygenated which is a must if you have plants in the pond. Quick and easy setup and the company even offers a huge 24-month warranty! A nice addition to your small pond/birdbath for aesthetics only. Has been chosen by Amazon as their ‘Amazon Choice’ considering the 4.5* average overall rating from over 1075 customers! 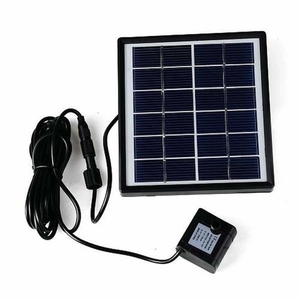 You cannot go wrong purchasing this solar pond kit. A solar pond pump is an environmentally-friendly alternative to a battery/mains powered pond pump, used to pump water around the pond, keeping it aerated and suitable for plants, etc. These pumps usually sit on a pond ledge or shelf, upon the pond liner itself. They are usually more expensive than conventional mains powered pumps due to the additional solar panel cost. However, are known to be considerably cheaper to run in the long term. 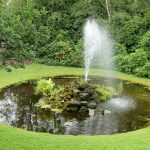 Pond pumps can also be used to aesthetically enhance a pond, if you’re looking for solar fountain pumps, this page has more suitable recommendations, especially for readers with smaller ponds/bird baths. Solar Pond Pumps collect solar energy from the sun. This is absorbed through the pumps attached photovoltaic panels, also known as solar panels. The pump’s solar panel(s) are usually connected to the pump system via wires, or are in-built to the pump system. For the pond pump to operate consistently, the solar panel must be placed in direct view of the sun and angled correctly, to prevent reflection. This is extremely important, as the power of the pump itself will vary, being solely dependent on the amount of solar energy transferred from the panel, to the pump, per second. Therefore, it’s important to consider the availability and strength of sunlight that’s available in your garden. Notice, I did not say your pond. This is because the solar panel can be attached via a long line of wire, offering up to 15 foot of an extension, enough to place in an area of the garden which gets the most sunlight. Typically they have an in-built pond filter, to prevent small debris from entering; Although some pumps need to be cleaned regularly. Going into more detail, there are some more specific factors which should be considered before making the final decision to which pump is right for your pond, these include..
Generally speaking, the higher the power output, the more powerful and effective the pump will be. This power rating is determined by the unit of Wattage (W). The level of power will have a direct impact on the amount of water that the pump can handle, at capacity level, and the distance to which it can be projected into the air. The majority of Solar Pond Pumps have a variable flow rate. This is dependent on the strength of the sun combined with the directional position of the solar panel. This combination of factors will impact on the pump’s performance, especially on cloudy days. Therefore it’s very important to consider the position of the pump within your garden, and place it a particular spot which gets the most continual sunlight over the day, only this will impact on its power. Regarding pump water flow, despite having a similar output wattage, not all pond pumps provide the same strength of water flow, due to different internal hardware causing efficiencies and inefficiencies. Therefore some are more powerful than others, despite the same apparent wattage. Therefore it’s extremely important to look at photo and video footage of the pump in action, alongside customer reviews. Regarding the solar-powered pond pumps that we are recommending readers to consider, we have featured this information, alongside links to follow to purchase the product. 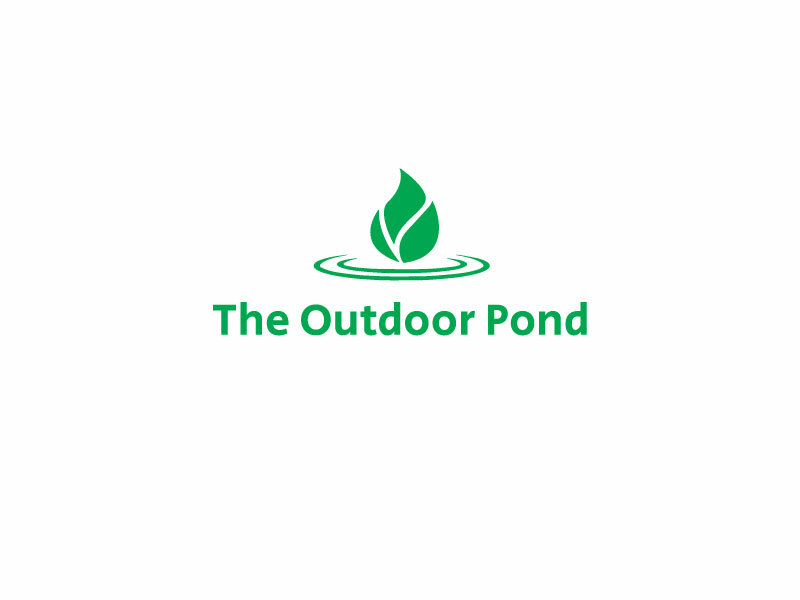 If you happen to be looking for a pump with a single purpose, to function as a pond aerator and oxygenate the pond, we advise looking at our recommendations of Solar Pond Aerators. We’ve featured an extremely popular one below. This device is simply a solar aerator, therefore if your single purpose is to boost oxygen levels within your pond, this is a great solution. The relatively modest wattage of the solar panel (1.5w) indicates that it is only suitable for small/medium sized ponds. We’ve heard of people using it in 300 Gallon KOI ponds, and with it’s 4-star overall rating, it seems to be very reliable. 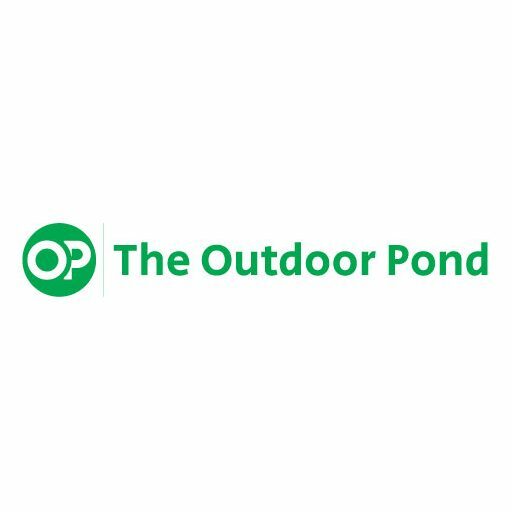 The Outdoor Pond is a Hub of all things pond-related.